Every few months I decide to challenge myself in some way and my most recent “30-day challenge” was to write a blog post every day in July. Now that this is over, I thought I’d write about my experience and provide some feedback on the results. One of the reasons for pushing myself with this challenge is that I think about writing a lot but never actually do it. I’ve always found that carving out the time to write and then actually sitting down in front of a keyboard – without distraction – has always been the most difficult part for me. This challenge forced me to confront this issue head on and I think it helped. The first week or so was hardest but as the month progressed, my reluctance and inhibitions eroded and the whole process felt more natural and easier. The challenge to write every single day was both a blessing and a curse. But taking the weekends off would not have been as effective. This process was about creating a new habit and I believe that in order to do that you need to do something daily; if I could skip one day then it would be easier to skip the next. This was really tough at times too. There were days on a weekend when I had been out for the entire day with family or friends but still needed to write a post when I got home. It would have been so easy to skip them if not for forcing this 7-days a week rule. But I am glad that I didn’t skip these weekend posts. Some of my favourite posts were written on the weekend and I simply don’t think that they would have been created within the confines of a working week. They also received more visits than those written during the week. As most content marketers know, more content means more opportunities to connect with your audience. Sharing tips, thoughts and more importantly answering questions and solving problems will deliver an endless supply of evergreen visitors to your site. 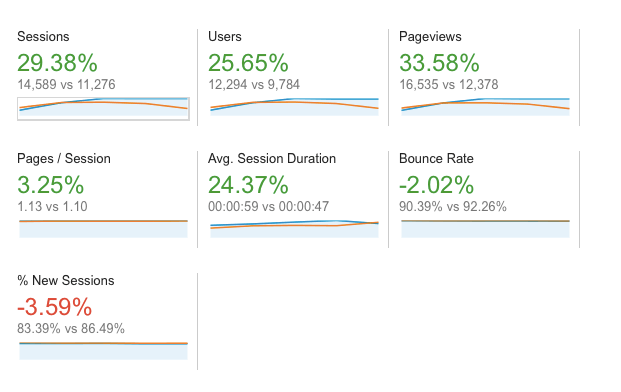 During the month of July, the traffic on my site increased by 29.38%. There’s more content that may answer someone’s question via a search engine plus a few of the more informative posts (e.g. Siri commands for Apple Music) were shared quite a bit on social media. I have a blog post that is three years old that still supplies 75%+ of my traffic. And so if I exclude that post from the results, my traffic increased by 27% (3% less than the overall increase) which means that my 30% increase wasn’t from the new content. 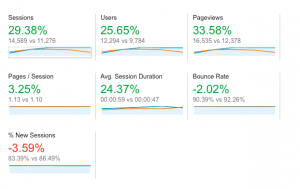 The other posts gained more traffic too – some of which from new visitors – but if you look at new visitors vs existing visitor numbers and the bounce rate for these posts, you can see that this was a small percentage of the increase. It seems to prove once again that more, fresh content raises gets Google’s attention and raises the “freshness” attribute of your site which seems to have a positive impact site wide. The other interesting observation was that being first with an answer makes all the difference. The post I mentioned earlier that drives 75%+ of my traffic was an answer to a question about Apple TV that didn’t exist before I created it and so Google now see’s that post as the authority answer to that question. The only post from July that made it into the Top 10 for traffic on my site was a post on uninstalling iOS9 beta. It was something that I wrote early on a Saturday morning and soon after iOS9 beta was released. It was one of the first posts on the topic and because of that ranked very well for all related phrases. I am not designed to write every day, but I will write more frequently than before as a result of this challenge. It has been a great experience and I would recommend it to anyone. It also threw out some interesting insights. You should also write about new solutions and new ideas as soon as you can – there is a small window of opportunity and if you delay writing or posting based on some content calendar then you will miss your chance. Lastly, writing on the weekends – even for businesses – has advantages. You might have more time, you have a chance to get ahead of the competition who might wait to write about news on Monday, and there is simply less content around at the weekend and so you increase your chances of reaching your audience and getting what you have written actually read.